1711 Post Paid 4d at Hubberston to London. The image above is the result of cleaning the original image in Adobe Photoshop to remove the text of the letter which shows through the paper, making it difficult to identify the handwriting "Post Pd 4d at Hubberstone". 1912 Dyserth (Flintshire) - church and castle hill. instructional mark, e.g. PostPaid 4d - W.O. (the initials of the Pwllheli postmaster William Owen). 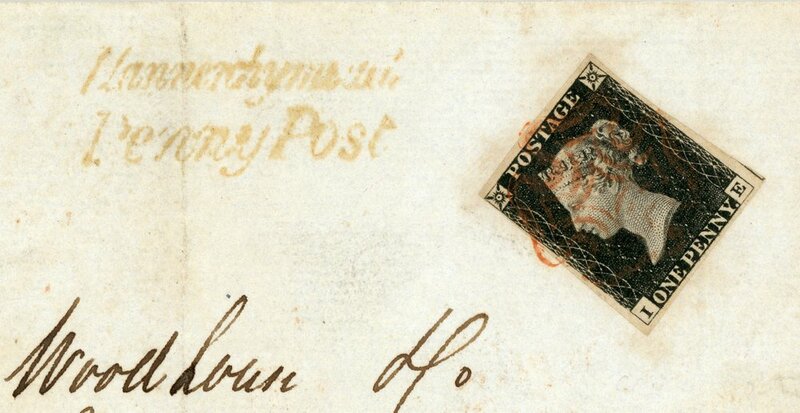 On the reverse is a manuscript Pwllhely -= also written by the postmaster in lieu of a town handstamp. of Postal History (Volume 5), 1990; edited by Willcocks R.M. and Jay B.
history of Wales from the time of Roman occupation to the present time. (currently an Epson Perfection V600) connected to an Apple MacPro computer. and 3200 d.p.i. (e.g. Queen Victoria line-engraved, or surface-printed stamps). of the folded letter, and as many pages of the contents of the letter as are appropriate. as either a TIFF and/or JPEG files.